On Wednesday afternoon, I went to the regular doctor’s office for a checkup. Other than an ear infection, I didn’t get bad news. I attended a Ladies’ Bible study earlier that morning and we got talking about medical stuff. One lady exercises regularly and eats pretty healthily. She reads a lot about the medicines folks regularly take and listens to the news. She informed us that a drug to help hearts causes cancer, so there’s a big re-call. Then we got talking about vaccines for little ones and flu shots, the pros and cons. One of our ladies recently got diagnosed with cancer and before she got her results she’d already made up her mind that she’s not having chemo-therapy or radiation. Another lady at our church got diagnosed with cancer a few months ago and she is accepting treatment for the disease. We, as their church family, are praying for both of them to recover. It’s not an easy time for them or us, but God is faithful and so we take courage. God is good and the devil is not. God is all powerful and the devil is the defeated foe. Why then do Christians fall under the devil’s limited power? Our Friday afternoon Bible study read through Mark 11 yesterday, in the New King James Version. After each section, I’d teach what it meant with God’s help and I also listened to the others’ opinions. When we came near the end of the chapter at verse 19, we’re told they left the city in the evening. In the beginning of the chapter Jesus looked through the leaves of a fig tree hoping for figs because He was hungry. It wasn’t the season for the fruit but I’ve heard that occasionally there is a second growth. When the tree proved to be unfruitful, Jesus cursed the fig tree. Mark 11:20 Now in the morning, as they passed by, they saw the fig tree dried up from the roots. Mar 11:22 So Jesus answered and said to them, “Have faith in God. Mar 11:23 For assuredly, I say to you, whoever says to this mountain, ‘Be removed and be cast into the sea,’ and does not doubt in his heart, but believes that those things he says will be done, he will have whatever he says. Mar 11:24 Therefore I say to you, whatever things you ask when you pray, believe that you receive them, and you will have them. Mar 11:25 “And whenever you stand praying, if you have anything against anyone, forgive him, that your Father in heaven may also forgive you your trespasses. I stopped a minute to think. How often do I pray with absolute, unshakable faith? A few years back, I prayed for a pastor set to go in for surgery by the end of the week. In full faith, I told him God could heal him so he wouldn’t need the procedure. When he asked me to pray, my faith wavered. I did pray but he knew my confidence had fled. Every month now, we pray for healing at our church. My faith rarely wavers and if it does, I ask God to give me faith, right in the middle of the praying and receive it. Sometimes God moves and answers our prayers. Other times, it seems as though people leave with their illnesses intact. I don’t doubt God’s ability. I’ve seen too many answers to prayer and many healings. Perhaps our sin hinders God’s response or we harbor bitterness against others. Maybe we’re in a Job situation. When King David asked God to cleanse his heart and renew a right spirit within him, I believe he received what he asked for, a right standing with God. He also lived a life filled with consequences for previous sins. When King David ignored his son’s sinful behavior and failed to punish him, as noted in 2 Samuel 13, Absalom, another son of David’s with a different mother, took vengeance. Things got worse from there. I believe when we Christians live for ourselves and disregard God’s commands, we empower the devil to come against us and God allows consequences so hopefully, we’ll wake up and commit ourselves to follow God with all our being. The devil is defeated but he’s crafty and he lays traps for people. May God bless you and me. I need Him more all the time. A few days ago, my husband and I swung by my youngest daughter’s house to see her and her brother, and later, her husband. We stayed for dinner and then headed north to see their sister and family. Before we left, I got a tour of her garden while we waited for the food in the oven to heat. I grew some vegetables at the side of our garage, which is not the best place for sun and rain to hit. With all the water coming from the clouds this summer in Upstate New York, tomatoes have been bountiful. Zucchini showed up regularly on one plant in small batches and the smaller plant, green as the squash itself hasn’t produced one piece of fruit. I don’t know if the animals are getting them before us or if it’s because it’s a little crowded at that spot. I have more tomato plants than I planted, either because my husband runs over the trailing vines and the seeds squirt into the soil, or the birds are dropping tomato seeds after they’ve eaten some of the produce. So, I’ve been giving a lot of cherry tomatoes and ten medium-sized tomatoes away besides eating a bunch myself. The Canadian geese may be on their way South. I love seeing them in their V-formation, but the older I get, I realize I enjoy seeing them more in Spring than leaving in Fall. Anticipating Spring gets my mind and body ready for flowers and gardening. Preparing for Winter gets me checking out blankets, heavy outdoor clothing, tires with good tread for handling snowy roads, an ice-melter so we don’t fall on the sidewalks, boots, and filters for our furnace, etc. As a younger person, Fall was my favorite season. It still is in some respects, but now it reminds me that Winter is around the corner and that is less appealing as I age. Although, every season has its beauty. chai or ginger or lemon or rooibos, to name a few. I buy hot chocolate for the younger generation and my husband. After shoveling, he likes to dunk peanut butter toast into hot chocolate to thaw out and to enjoy a childhood favorite food combination. I didn’t think that way. All I thought was that the worker looked sad and I wondered if selling less product meant that she would lose her job. With all the storms and fires in America at the moment, people are probably not rushing out to get ice cream. Many folks give to charities to help those in trouble, even thousands of miles away in this country. Our church is going to take an offering for Convoy of Hope this Sunday. They are a first responder to disasters and we helped them for a few days when Hurricane Katrina hit New Orleans back in 2005. We know they are a reputable organization. I told him they have their priorities out of order. Then I told him an elderly lady at our Bible study asked us to pray for them today and so we did, beseeching God to send the hurricane out to sea and to not allow any lives to be lost in boats. Sometimes I like to get away from home, but as we traveled on Monday night, we got hit with such a rain storm with lightning splitting the sky that we pulled off the road. My husband couldn’t see and he said if the professionals are waiting for better visibility he would follow their example. We arrived late but safe. Thank You, Jesus! It’s nice to be home again. I hope you are well. May God bless you! Sunday morning we went to a picnic spot with a pond and a pavilion. We enjoyed a beautiful sunshiny day and lots of pleasant company accompanied by some tasty food. I got to know some of the people better that visited this year. After singing, my husband left the sound booth so we could pray. Seven folks gathered and he didn’t feel like a sermon was the right route to go. We didn’t linger a long time, but as we left each face exhibited peace and contentment. Sometimes I cook on a Sunday night, but if I’m tired and we’re able to, we eat out. There’s not a lot of restaurants open at that hour of the day. I told my hubbie I was going to pray about it. We have a number of small towns around our little home spot and I’m not familiar with them all. I felt impressed to head north and he was okay with it. We found a new restaurant, to us, that we both enjoyed and hope to visit again sometime. I said, “What a nice day we had,” and he agreed. This is the second Sunday night we’ve prayed at our church over the last thirty days and the people really liked it. Both times it was spontaneous and I missed the first one for a family member’s milestone birthday party in a nearby city. I’m glad I made it for lots of reasons but when I saw the glow on one of the ladies’ faces outside of the church after the meeting, I thought, Aw, wish I’d been there. God gave me the desire of my heart this last Sunday. Because of the time of day, I rightly assessed the nature of her call, it wasn’t good news. She didn’t ask for my advice but when I heard my young grandson had another fever of 103 degrees Fahrenheit and the pain in his legs from five days ago had now turned into him only being able to stand on his tippy-toes, I told her to take him to the hospital with the best care for children. Her pediatrician agreed, so off they went. So we’ve dealt with it and moved on. Last week my grandson had been diagnosed with the flu by his pediatrician, sight unseen. At the hospital, they said it was a virus and his body’s immune system sent enzymes to fight it. They were too high, although not alarmingly off and he was dehydrated. So they monitored his enzymes overnight and gave him an IV to get his fluids up. As soon as I heard about it, I told her I’d drive up. We asked people to pray. I’ve found this Bible verse true more than once in my life: Philippians 4:6, (KJV): Be careful for nothing; but in every thing by prayer and supplication with thanksgiving let your requests be made known unto God. Php 4:7 And the peace of God, which passeth all understanding, shall keep your hearts and minds through Christ Jesus. My husband and I rearranged what we could of our schedules. The dr.’s told her the virus could affect individuals in various ways. That night, her oldest son’s digestion erupted and the three adults in the house pitched in to clean up the vomit. We only saw them for about half an hour once they got home in the afternoon. My husband needed to be at work. When my grandson came in pale and shaky and still on his tip toes a bit I almost started crying. My husband told him to flatten his feet out and he worked at it and then smiled as he regained total balance. I guess he slept from the afternoon all the way through until morning. The oldest finally got his stomach to settle just after we left. I’d been doing laundry and cleaning and bringing him water with advice to take it slowly –which he ignored the first time. His poor tummy. I tucked blankets around him and felt his forehead for fever. His grandpa went to buy him ginger ale. When his mom got home, she sat close to him and I gave her the watered-down ginger ale that I’d swirled to get the bubbles out of. She fed him a teaspoonful and got close to look in his eyes. She spoke softly and they seemed to be closed off from all the rest of us. I could sense him relaxing. “Mom and my brother are home, all is well now,” radiated from him. It was so hard to leave. We haven’t seen them in a while. Yet, I’m the one who invited my husband which knocked a day off of our availability. He took her some pajamas and stuff into the city in the dark of night. I hadn’t thought of that when I asked him to accompany me. He’s the kind of dad that listens to his kids, so I’m sure she found comfort in him showing up. She said she was glad he made it there, too. She was just trying to figure out if I could extend my stay. I had an appointment today, so that’s the way it goes sometimes. I’ll see her before too long if my time doesn’t get hijacked again. I make plans and then adjust them when life rears up with an alternate scenario. I wonder if my son’s misfortune happened to prevent my grandson from going to the wrong hospital and ending up with kidney damage. Only God knows. May God bless you this last week of February. About a month ago, I got The Lost Detective: Becoming Dashiell Hammet by Nathan Ward out of the library. It’s published by Bloomsbury, New York, NY and copyrighted in 2015. Being Christmas and with all else that went on at that time, I didn’t get to read it until lately. 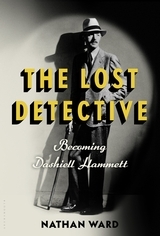 Dashiell Hammet wrote hard-boiled detective stories based on his time as a private eye with the Pinkerton National Detective Agency in 1915 through the middle of 1917. One of his famous characters is Sam Spade. I’m intrigued with decisions people make and the course their lives take. I have been since my childhood days when my mom encouraged me to visit the elderly next door neighbor women. I read James Scott Bell’s fiction and own a few of his books on the craft of writing. I’ve been praying about whether to write another novel and his book, Just Write is sparking my imagination.